My earliest memory of the Olympic Games was sitting in the crowd for the Athletics at Sydney 2000. I was wearing a ridiculously oversized jacket, my face painted with the colours of the Australian flag. My older brother somehow convinced me that it was a good idea to start a chant. I was so nervous, I’m pretty sure the first “Aussie Aussie Aussie” was silent as it came out of my mouth. But by attempt twenty seven, the old couple behind us had joined in. I was pretty stoked. I now write this blog on flight QF27 from Sydney to Rio de Janeiro, on my way to compete at the 2016 Olympics. I think the awkward seven year old sitting in the crowd at Sydney 2000 would’ve probably wet her pants if you’d told her this would even be a possibility. The two months of training upon return for the final leg of the World Series in Clermont-Ferrand have been incredibly demanding. As a squad, we made a conscious decision each and every day to put in an effort worthy of winning Olympic Gold. Part of our preparation was a six game series against Japan at our training base in Sydney. The games followed an Olympic format, in order to prepare us for the timing and recovery between games. It was a really good chance for the squad to gain valuable playing time, particularly with final selections looming. 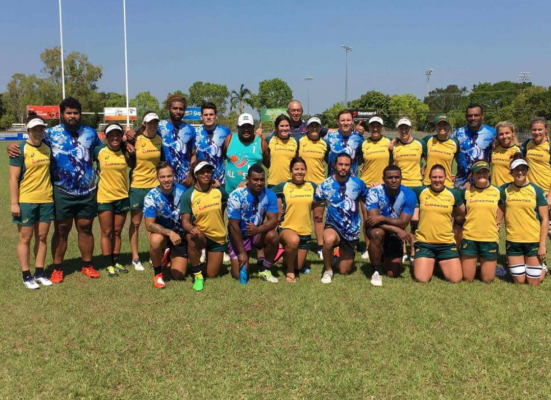 Following the tournament against Japan, we travelled North to sweaty sweaty Darwin, where the locals informed us 30 degrees (Celcius) was a lovely cool winter. An intense week of training was one of our most clinical to date, with plenty gained from training against the local men’s team. The Olympic announcement on July 14th was easily one of the best days of my life. It was quite overwhelming, so many emotions; multiple photos, videos and interviews with different media outlets. We received a huge Qantas boarding pass, and combined with two suitcases full of Australian gear, we were ready to go. A quick mention to Tiana Penitani (who unfortunately can’t join us in Rio due to injury), for your unrelenting work ethic and resilience, and for consistently inspiring me to keep working hard even when things don’t always go to plan. Upon arrival in Rio, we will travel down the coast to Portobello, to allow our bodies to acclimatise and adjust to the time difference. We will then head in to the Olympic Village, and prepare for pool games against Fiji, Colombia and USA. To the family, friends and fans who will be in the stands, or watching on TV, I hope that we can make you proud. And to the young kids out there with Olympic-sized dreams, I hope that one day you too may get to experience this indescribable sense of honour that I feel in wearing the green and gold to represent my country at the biggest sporting event in the world. Ps. If anyone is mates with Usain Bolt, could you please let him know I’ll be hanging out at Maccas in the village ready to down a few chicken nuggets to help him prepare for his race. Chloe Dalton is a key player in the Australian Women's Sevens Squad, helping her side to win their first ever Women's Sevens World Series in 2016.